You can see what a reader thought about the Orange Blossom range for normal skin here. Having read nothing but glowing reviews I thought it was about time I put Therapi to the test myself. 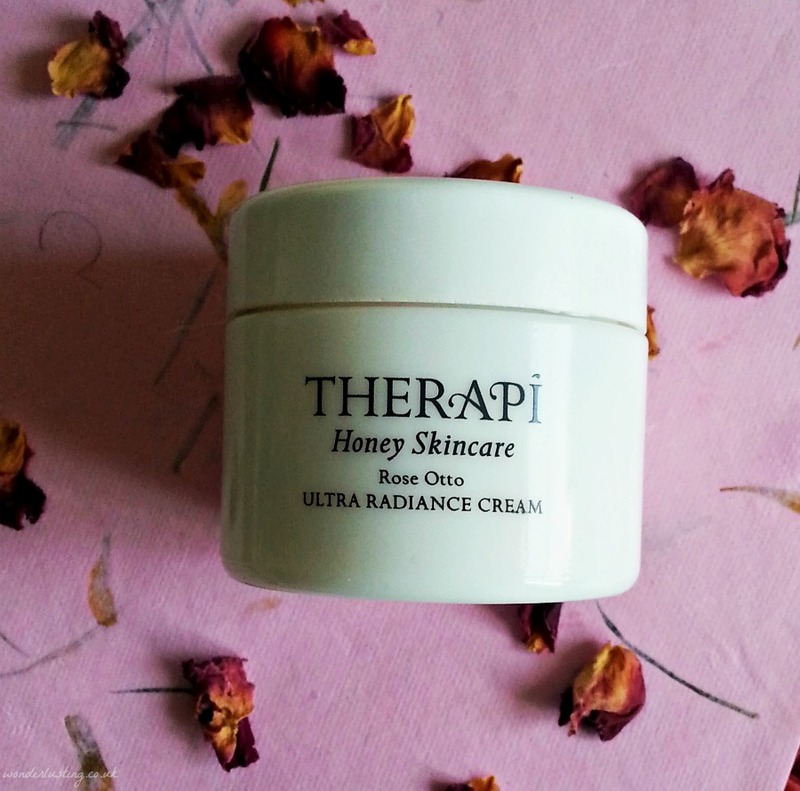 With my verging on crocodile skin during the winter, I headed right for the richest product in the range – Therapi Rose Otto Ultra Radiance Cream*. And as you can see from the name it contains my beloved rose so resistance was futile. The formula for this moisturiser includes five different organic rose extracts, organic shea butter and organic plant oils including almond, jojoba, rosehip, beeswax and propolis extract. This stuff is rich baby. Propolis is a natural resin produced by those busy bees, which they use in building their hives. It’s a time honoured ancient remedy used in many civilisations including by the Egyptians who used it in the mummification process. Modern research has shown wound healing properties, the ability to inhibit fungal and bacterial growth and high antioxidant levels. So go bees! The texture of the Rose Otto Ultra Radiance cream is thick verging on balm-like. I noticed half way through the pot, the texture became grainy, which disappeared as soon as it was rubbed in to the skin. This is perfectly normal with unrefined shea butter especially when the weather changes so don’t be concerned if you experience the same. In the winter, my skin practically aaaahed when I put it on, it feels ultra nourishing and the fragrance is so soothing. The instructions state to use it as a daily moisturiser morning and night. That would be far too much for my skin. Extremely dry or mature skin would lap this up. It has no SPF so I use it as a night time moisturiser or when I feel my skin needs some extra pampering. My favourite way to use the Therapi Ultra Radiance Cream is as an AMAZING GLOW GETTING treatment. I do this treatment twice a week or whenever my skin is looking a bit blah. The first time I tried the treatment, several people who I’d never met before complimented me on my skin. In short I LOVE Therapi Ultra Radiance Cream. I would buy it bunches of roses if I could. This sounds sumptuous. Rose Otto is so gorgeous & expensive. Must have missed this post, but thanks for the info, sounds like something my thirsty & sensitive skin would love in winter!